One of the wittiest and most quotable movies of all time is Monty Python and the Holy Grail (1975). It is a personal favorite and the most graphic scene in the movie is a sword fight between King Arthur and a stubborn black knight guarding a wee bridge. As the black knight loses a limb, Kind Arthur demands that he surrender. 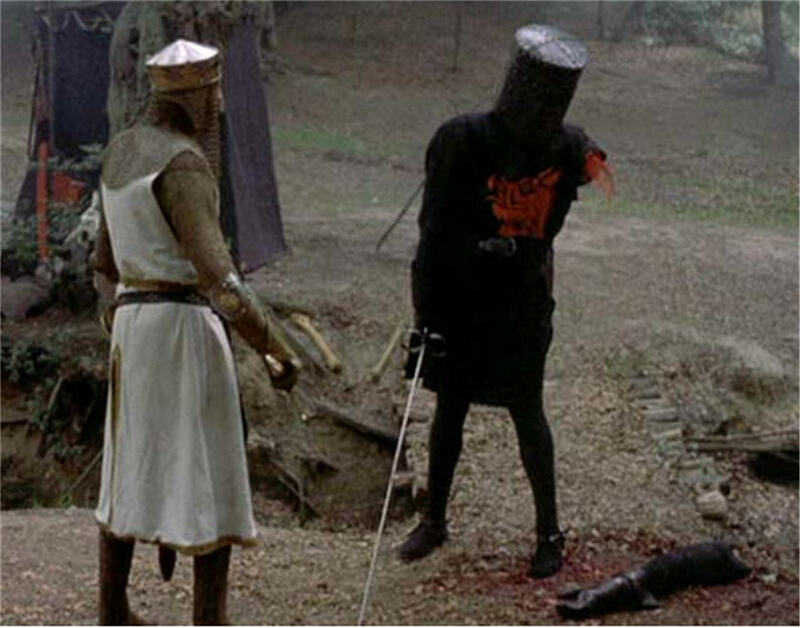 The black knight claims that losing an arm is “just a flesh wound” and continues the fight while King Arthur stands there bewildered. Watch the clip below for full amusement. Like the black knight, we are in a world full of walking wounded and in pain. The pain is a reminder that sin has plagued us and quite frankly I’m tired of the pain. Thankfully there is hope in many places. Psalm 23 provides great comfort in what lies ahead in heaven where there will be no more tears and no more pain or strife. But we are not there yet so why does pain exist beyond be a reminder of the fall? What does God teach us in pain? In the movie Invictus, there is a great exchange when Nelson Mandela asks Francois Pienaar, the South African Rugby Captain, about if he was feeling 100% in preparation for the next match. Francois’ responded humbly that no one is ever 100% free from pain or injury. It is the same in all things in life. My mother is awaiting a knee replacement. My father has been battling a severe staph infection and is waiting on a hip replacement. We renovated our house and were fighting bumps and bruises for almost a year. Our dog has ACL surgery and we have to literally pick him up to help him go to the bathroom outside. My wife has had the painful duty of taking care of us all. My previous job was painful and stressful and left me far outside of my comfort zone. Too often pain tends to keep us focused on ourselves but when we stop to look around we see that we are not alone. In fact, I have many friends who are suffering much worse things like cancer, severe mental illness, greater physical injuries or have lost loved ones. We are surrounded by pain. In the book, The Problem of Pain by C.S. Lewis, he points out the struggle. Ultimately pain serves a purpose and we should be thankful for its purpose. If we had no pain, we would be home in heaven. But we’re not there yet. Pain tells me that life is real. Pain tells me that I need help. Pain tells me that I need Christ. Pain tells me that I’m not home yet and to keep pushing forward.